The Chicago Cubs are returning for the annual Las Vegas Big League Weekend, and this year they’ll be joined by the Cincinnati Reds at Cashman Field on March 25-26. The Cubs will make their 13th straight appearance in Las Vegas for the event. The Cubs have recorded a total of 18 sellouts over the past 12 seasons (2005-16) for their annual Big League Weekend visits to Cashman Field. In 2016, the Cubs total attendance for the Big League Weekend two-day event was 22,020. The Cubs defeated the 2015 National League Champion New York Mets, 5-1, on March 31 before a sellout crowd of 11,025. The Mets then defeated the Cubs, 8-1, on April 1 before another sellout crowd of 10,995. The Cubs, under Joe Maddon, compiled a Major League best 103-58 record (.640) in 2016 and advanced to the World Series for the first time in 71 years (1945) and then captured the World Series championship for the first time in 108 years (1908) in a thrilling seven-game series against the Cleveland Indians. “We are excited to announce that the World Series champions will return to Las Vegas for the 13th straight season,” 51s President/COO Don Logan said. “We also welcome Cincinnati back to Big League Weekend for their third all-time visit. “The two-game series between the Cubs and Reds will provide a great atmosphere in the ballpark. The fans, both locally and the tourists that visit during this event, will have a memorable time. 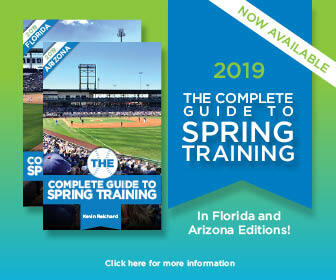 The Cubs have such a tremendous nationwide fan-base and Las Vegas has become a ‘second’ spring training home for them. Cincinnati will be making its third all-time appearance to Cashman Field for Big League Weekend. The Reds’ last appearance was vs. the Cubs on March 12, 2011 before a crowd of 9,047 (Reds defeated the Cubs, 9-8). Cincinnati faced the L.A. Dodgers at Cashman Field on March 31, 2010 before a sellout crowd of 11,896 (Reds defeated the Dodgers, 12-4). Time for Final Four, Best of the Ballparks 2019, Cactus League Edition!